All my anglers out there LISTEN UP! Lisa here to give you the December fishing update! This update comes straight from Captain Stewart Ames (he&apos;s the best) and Gone Fishing Charters, so I would listen closely! December fishing is very dependent on Tampa Bay Weather. Warm weather can make the waters a fisherman&apos;s dream, where a quick cold snap will do quite the opposite. During this transition into colder weather, the fish species that are available are also changing. Say goodbye to the Kingfish, Spanish Mackerel and Bonita they headed South when the first cold front came through in November. All of these fish had to head out and make room for my favorite... the grouper! What&apos;s exciting is the opportunity to catch grouper (of legal size) from the shore of Tampa Bay Area Beaches! But you better move quickly, this only lasts about four to six weeks. 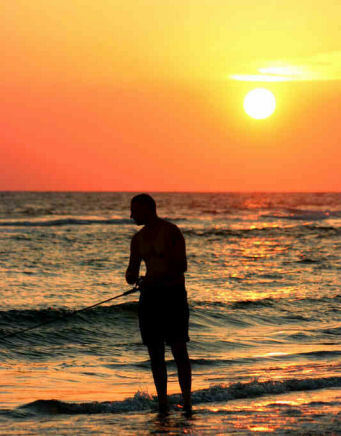 To catch a grouper from shore Captain Ames recommends whitebait and pinfish. These are both available to Tampa Fishing Guides. Make sure you do some research about the types of lines you will want to use. Heavier lines make things easier, while thinner ones give you a real test. If you are going to be fishing from a larger boat, Captain Ames recommends fishing channel edges or the potholes on the lower phases of the tide. And the colder it gets, shrimp seems to be the best bait. You might also luck out and find some fish around residential docks, but that&apos;s more luck than anything. Fish are smart, and with the onset of colder weather and water temperatures they are heading South to stay warm. Have no fear though, winter Trout fishing is right around the corner! As the Tampa Bay Weather changes more large seatrout make their way to our grass flats. Gator Trout are the main focus from November to early March because of their size. Moving tides will offer the best bites of these fish. Obviously it&apos;s best to research the tides, bait, lines, reels, etc. before heading out on the open water. And if you aren&apos;t much of a captain yourself, there are plenty of Tampa Bay Tours available in the Tampa area. Well that&apos;s all for now Tampa, but stay tuned for more Things To Do In Tampa Bay, and Tampa Florida News Updates!